The special bubbles have an effect on you as well as the enemies, such as you get washed away with the water. Now , it is the beginning of a fantastic story! Let us make a journey to the cave of monsters! Good luck! And with words to that effect, it’s the beginning of one of the most infectious games ever released. We’re talking Swine Flu Infectious levels here. This game stars the rather unfortunate heroes of Bub & Bob. The stars of Bubble Bobble have been turned into cute, bubble blowing dinosaurs and had their girlfriends captured by an intreaguing character who’s name in English was “Super Drunk”, and put them in a cave 100 levels underground. Our intrepid adventures set off through these 100 caves, to try and defeat Super Drunk and rescue their missuses, and hopefully return to being normal human beings. There is a whopping 100 levels in this game, and to progress through each one, you have to defeat all the monsters located on the screen. Defeating the monsters require them to be encased in bubbles, and then popped (or destroyed by one of the special bubbles of fire, water or lightening). The method used to destroy the monsters causes various fruits or gems to be released, obviously the fancier the kill, the bigger the points. Items can also be picked up which will give you points, but also give you a wide array of powerups such as speed boosts, bubble upgrades, or indeed smart bombs, bonus levels & fireballs. 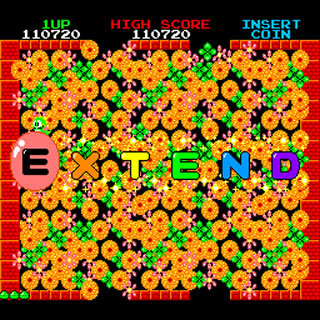 Extra lives are obtained at point totals or by collecting the EXTEND letters. Of course, you’ll need every single powerup you can get your hands on to progress through the 100 levels. This game is tough, very tough. The enemies themselves aren’t particularly difficult, but the level design mixed with the number of bad guys, along with the strict time limit (after a short while, the enemies get faster, and a little later an undefeatable baddie appears to kill you), mean that this game isn’t easy by a long shot. Getting the "Extend" Bubbles gives you an extra life and a level warp. But yet you keep playing. Over 20 years since it was released. Why? Well, this game is simple, yet addictive. It’s requires a focussed mentality of getting through the task at hand, rather than worrying about future levels, and a monotonous ability to zone out to dominate this game. Zoning out is not helped by the graphics, which at the time are excellent, and the music, which is easily one of the most infectious tunes ever. 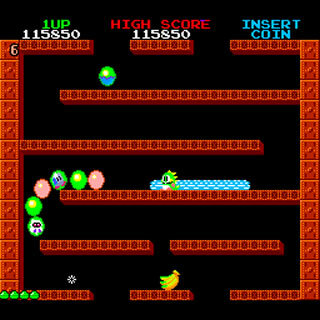 Bubble Bobble was nothing short of a smash, yet has constantly managed to reinvent itself, a rare feat in video gaming. The simplicity of the formula, a lack of overselling, plus actual decent spinoffs, make it a marketable franchise even today. But that helped because the game itself was so much a hit. It was a hit, so much so, that Bub & Bob remained as bubble blowing dinosaurs, even after this game. Aah, so many memories – probably my fave retro game of all time. Bought it in 1987 for the Spectrum after spending many a 20p in the local arcades and played it to death. To this day, every now and again I take the phone off the hook, make myself comfy and indulge myself in some bubbling. A truly amazing game.